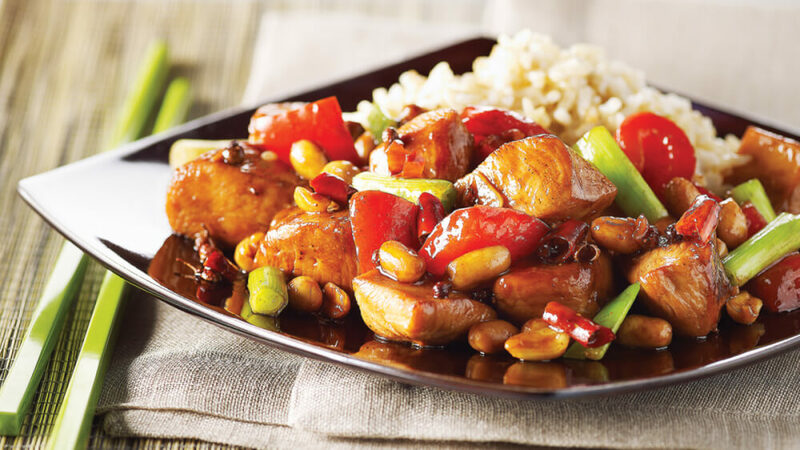 Served over rice or egg noodles, this chicken kung pao recipe is so good, and contrasts delicious flavours for a wonderful result in every mouthful. As well as the chicken we are using soy sauce, ginger garlic, peanut butter, vegetables and more, to lend an authentic flavour to the recipe. 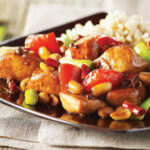 Sometimes spelled kung po, kung pao is a classic, spicy, Sichuan dish. You can get takeout versions or try it in a restaurant, but the best way to enjoy kung pao chicken is to make your own at home. You can really appreciate the superior flavour if you make your own and make it less or more spicy, as you prefer. 1. Combine the cornflour, ginger, soy sauce, sugar, garlic, water, chilli flakes, and peanut butter. 2. Put 2 tablespoons of this sauce in a bowl and toss the diced chicken in there. 3. Let it marinate at room temperature for about 10 minutes. 4. Now heat 2 teaspoons of the oil until nearly smoking. 5. Add the chicken and cook through, then set to one side. 6. Add the other teaspoon of oil to the pan and heat it up. 7. Cook the green peppers and onion in there for 5 minutes. 8. You can add a little water if the pan gets too dry. 9. Now you can add the rest of the sauce over the vegetables. 10. Boil for 1 minute. 11. Again, add a little water if necessary.